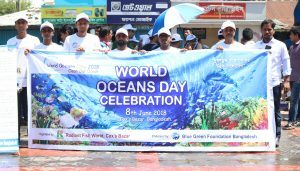 On 8th June 2018, World Oceans Day has been celebrated in Bangladesh with numerous of day long activities in the tourist city Cox's Bazar, the place where the longest undivided sea beach of the world is situated. The program was hosted by the Radiant Fish World (The first live fish aquarium in the country) and endorsed by Blue Green Foundation Bangladesh. Mr. Atikujjaman Khan Kabir, the chairman of the tourist corporation was the Chief Guest and Mr. Md. Zillur Rahman Superintendent of tourist police was there as a special guest. Mr. Shafikur Rahman Chowdhury, the founder and managing director of the first live fish aquarium in Bangladesh presided over the program. The whole program was coordinated by Dr. Mohammad Muslem Uddin; founder and president of Blue Green Foundation. Students from different educational institutions and general people from various corners of the country gathered to the tourist city Cox's Bazar for celebrating the day with a global call of stopping plastic pollution. A series of day long programs were there to encourage massive people to become more responsible concerning the ocean and atmosphere. Among them- Ocean Day Rally, Beach Clean Up, Surfing, Life Fish Aquarium Visit, Poster Presentations, Live Model Presentation, Drawing Competition, Quiz Competition, Presentation, Prize giving ceremony etc were mention-worthy. A gathering of approximately one thousand students and massive people march towards Cox's Bazar sea beach; the longest undivided sea-beach of the world with a rally holding different banners, festoons and play-cards which started at 10:00 am from the compound of Radiant Fish World aquarium. After the rally there was beach cleanup program followed by a surfing show. The chief coordinator of the program Dr. Mohammad Muslem Uddin delivered a short speech emphasizing on the importance of ocean literacy and ecotourism. He also said that pollution free Bay of Bengal can ensure a future resourceful Bangladesh. After getting done with the rally the students returned to the aquarium compound in a view to visiting the live fish aquarium. Followed the visit students joined in a poster presentation conducted by dedicated volunteer of Blue Green Foundation Bangladesh. The excitements and joys of the students knew no bounds when they got a chance to participate in a exciting art and quiz competition to demonstrate their acquired knowledge over ocean and atmosphere. Finally the winner of the competition were awarded with crest to encourage them to learn and contribute more for this gracious job in the upcoming days.